IMM SCHATTEN DES GLUCKS (1919) directed by Jacob and Louise Fleck. TRAGODIE DER LIEBE (1923) directed by Joe May. SO SIND DIE MANNER (1923) directed by Georg Jacoby. MENSCH AM WEGE,DER (1923) directed by William Dieterle. MONSCH VON SANTAREM,DER (1924) directed by Lothar Mendes. SPRUNG INS LEBEN,DER (1924) directed by Johannes Guter. TANZER MEINER FRAU,DER (1925) directed by Alexander Korda. MANON LESCAUT (1926) directed by Arthur Robison. MADAME WUNSCHT KEINE KINDER (1926) directed by Alexander Korda. DUBARRY VON HEUTE,EINE (1927) directed by Alexander Korda. JUXBARON,DER (1927) directed by Willi Wolff. KOPF HOCH,CHARLY! (1927) directed by Willi Wolff. SEIN GROBTER BLUFF (1927) directed by Harry Piel/Henrick Galeen. CAFE ELEKTRIC (1927) directed by Gustav Ucicky. PRIZESSIN OLALO (1928) directed by Robert Land. GEFAHREN DER BRAUTZEIT (1929) directed by Fred Sauer. ICH KUSSE IHRE HAND,MADAME (1929) directed by Robert Land. FRAU NACH DER MAN SICH SEHNT,DIE (1929) directed by Curtis Bernhardt. SCHIFF DER VERLORENEN MENSCHEN,DAS (1929) directed by Maurice Tourneur. BLAUE ENGEL,DER (1929) directed by Josef von Sternberg. MOROCCO (1930) directed by Josef Von Sternberg. DISHONORED (1931) directed by Josef Von Sternberg. 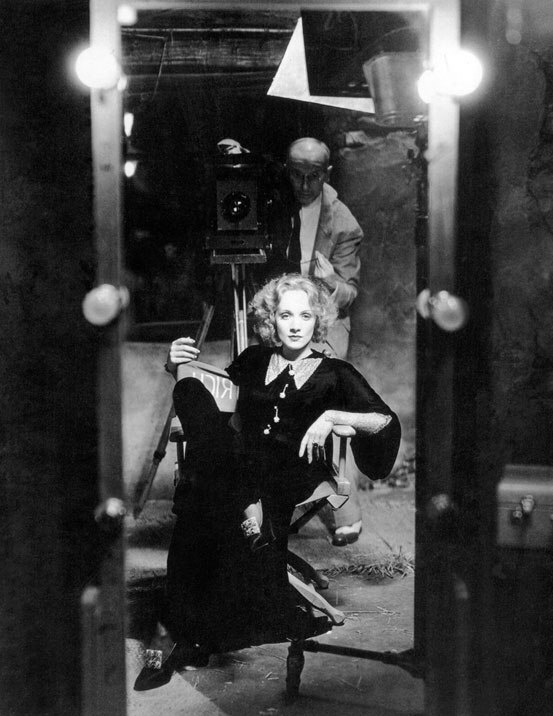 SHANGHAI EXPRESS (1932) directed by Josef Von Sternberg. BLONDE VENUS (1932) directed by Josef Von Sternberg. THE SONG OF SONGS (1933) directed by Rouben Mamoulian. THE SCARLET EMPRESS (1934) directed by Josef Von Sternberg. THE DEVIL IS A WOMAN (1935) directed by Josef Von Sternberg. I LOVED A SOLDIER (1936) directed by Henry Hathaway. DESIRE (1936) directed by Frank Borzage. THE GARDEN OF ALLAH (1936) directed by Richard Boleslawski. KNIGHT WITHOUT ARMOUR (1937) directed by Jacques Feyder. ANGEL (1937) directed by Ernst Lubitsch. DESTRY RIDES AGAIN (1939) directed by George Marshall. SEVEN SINNERS (1940) directed by Tay Garnett. THE FLAME OF NEW ORLEANS (1941) directed by Rene Clair. MANPOWER (1941) directed by Raoul Walsh. THE LADY IS WILLING (1942) directed by Mitchell Leisen. THE SPOILERS (1942) directed by Ray Enright. PITTSBURGH (1942) directed by Lewis Seiler. KISMET (1944) directed by William Dieterle. MARTIN ROUMAGNAC (1946) directed by Georges Lacombe. GOLDEN EARRINGS (1947) directed by Mitchell Leisen. A FOREIGN AFFAIR (1948) directed by Billy Wilder. JIGSAW (1949) directed by Fletcher Markle. STAGE FRIGHT (1950) directed by Alfred Hitchcock. NO HIGHWAY (1951) directed by Henry Koster. RANCHO NOTORIOUS (1952) directed by Fritz Lang. AROUND THE WORLD IN EIGHTY DAYS (1956) directed by Michael Anderson/John Farrow. THE MONTE CARLO STORY (1957) directed by Sam Taylor. WITNESS FOR THE PROSECUTION (1957) directed by Billy Wilder. TOUCH OF EVIL (1958) directed by Orson Welles. JUDGEMENT AT NUREMBERG (1961) directed by Stanley Kramer. PARIS-WHEN IT SIZZLES (1964) directed by Richard Quine. JUST A GIGOLO (1978) directed by David Hemmings. *MARLENE (1984) directed by Maximillian Schell.